So, today is the last push before the Queen’s Diamond Jubilee Weekend, and so it was that I arose from slumber feeling good and positive: just the morning and evening commute to go then it’s party time. Yeah. And of course, I was buoyed by the ‘nice day’ [see previous post] that I had yesterday. So it was, that I arrived at Hungerford station and waited for the 06:40 grown up train. Then it started, that faceless voice came over the speaker: ‘We are sorry to announce that the 06:40 will be delayed by 6-minutes.’; then it was 8 minutes; then it was 11 minutes. Then, the announcement said 4 minutes. Blimey, I thought, the train must be flying to make up that time so quickly, but I quickly realised that it was another grown up train, the 06:54 that was delayed, presumably by the 06:40. Eventually the 06:40 arrived and everybody got on quick so that we could be away before any of the 06:54 passengers turned and tried to sneak on our train (we don’t like sharing) :-). Under intense interrogation (actually it was one lady asking him one question), the Train Manager gave up the information we required, ‘Why was the train late?’. Well, the announcement “because of issues on the line between Westbury and Pewsey’ but we have now established that the issue actually meant Cows On The Line although we couldn’t quite tease out what we then wanted to hear, ‘The Wrong Sort Of Cows On The Line’. Never mind though, at least we found the reason and with such success, surely today would be a good day. I certainly hope so. Even the Underground looks as though it’s behaving itself :-). Yes, the underground was as good as gold. I went straight from the grown up train to the train of the deep almost without stopping and so go to work dead on time. The omens are good: the day shall be good. All bodes well for the weekend of celebrations. As for work, well, I spent the morning writing up my findings for a post incident report following a major power outage last Friday. All finished by lunch time, I decided to head off to St Katherine’s Dock to get a bite to eat and check out the boats. 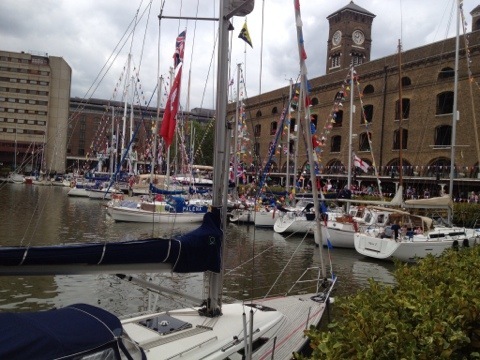 Well, There were many boats, virtually all of which were decked out with flags and bunting, presumably (stating the bleeding obvious) for the Jubilee. 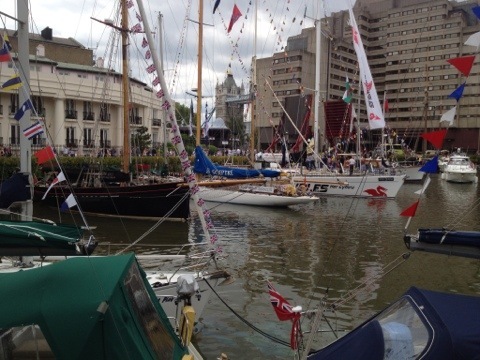 So, having viewed the boats and given my approval, I headed back, via Tower Bridge, to the office in time for my 13:30 meeting, followed by a 14:00 workshop before getting an early start (15:00) back home, to beat the inevitable crowds at Paddington. Then it happened: the naffing power went; all systems; all services down. Bother, we all thought, just when we thought the week was going to end well. I won’t go into the details: let’s face it, unless you were part of it, such events aren’t exactly high interest topics. All I will say is I didn’t get away until close on 16:00 and will have to finish what I was going to do, sometime over the weekend. The underground behaved impeccably and I just caught the 16:36 from Paddington. This has to be a record. But, I made it, and I got a seat (don’t tell her indoors, but I upgraded to 1st class just to be sure of a seat. Looking at all the standing passengers, it was a good move). Better still, we left on time. I’m guessing that all the berating over the last few days has taught these beastly trains that they must start to behave :-). We were only 7 minutes late from Reading, which, as I’ve inferred previously, is 3 minutes early. So all in all, a good job jobbed by rail travel. Lets just hope that there are no more cows on the line :-). Now, bring on that Diamond Jubilee. Yeah. Woo Hoo.